Denaturation is a process in which proteins lose their shape and, therefore, their function because of changes in pH or temperature. Proteins change their shape when exposed to different pH or temperatures. The body strictly regulates pH and temperature to prevent proteins such as enzymes from denaturing. Some proteins can refold after denaturation while others cannot. Chaperone proteins help some proteins fold into the correct shape. Each protein has its own unique sequence of amino acids and the interactions between these amino acids create a specify shape. This shape determines the protein’s function, from digesting protein in the stomach to carrying oxygen in the blood. If the protein is subject to changes in temperature, pH, or exposure to chemicals, the internal interactions between the protein’s amino acids can be altered, which in turn may alter the shape of the protein. Although the amino acid sequence (also known as the protein’s primary structure) does not change, the protein’s shape may change so much that it becomes dysfunctional, in which case the protein is considered denatured. Pepsin, the enzyme that breaks down protein in the stomach, only operates at a very low pH. At higher pHs pepsin’s conformation, the way its polypeptide chain is folded up in three dimensions, begins to change. The stomach maintains a very low pH to ensure that pepsin continues to digest protein and does not denature. Because almost all biochemical reactions require enzymes, and because almost all enzymes only work optimally within relatively narrow temperature and pH ranges, many homeostatic mechanisms regulate appropriate temperatures and pH so that the enzymes can maintain the shape of their active site. It is often possible to reverse denaturation because the primary structure of the polypeptide, the covalent bonds holding the amino acids in their correct sequence, is intact. Once the denaturing agent is removed, the original interactions between amino acids return the protein to its original conformation and it can resume its function. However, denaturation can be irreversible in extreme situations, like frying an egg. 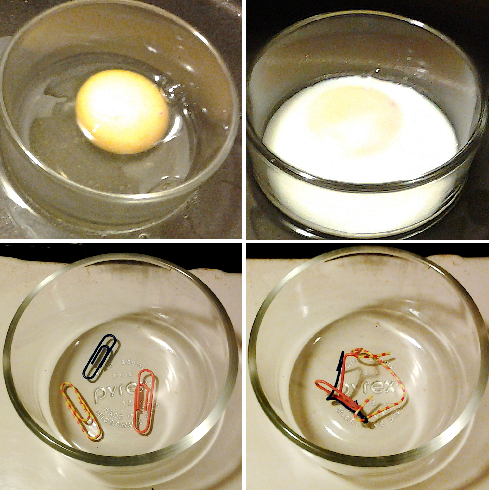 The heat from a pan denatures the albumin protein in the liquid egg white and it becomes insoluble. The protein in meat also denatures and becomes firm when cooked. Denaturing a protein is occasionally irreversible: (Top) The protein albumin in raw and cooked egg white. (Bottom) A paperclip analogy visualizes the process: when cross-linked, paperclips (‘amino acids’) no longer move freely; their structure is rearranged and ‘denatured’. Chaperone proteins (or chaperonins ) are helper proteins that provide favorable conditions for protein folding to take place. The chaperonins clump around the forming protein and prevent other polypeptide chains from aggregating. Once the target protein folds, the chaperonins disassociate.